In this post is a list of 24 stocks, which have broken out to the upside on big volume. The stocks listed in this post have experienced very unusual volume. I believe stocks which have broken out like this are at least worth adding to the watch list. However I must say the technicals on these stocks are not as bullish as they've been in the previous weeks, which may be a hint that a short term correction is near. If the market continues to rally however, these stocks should continue demonstrate strength in my opinion. As stated at the bottom of this post, I've picked two stocks from the list which I may be speculating with in the weeks to come. A month ago I chose to speculate with STEC Inc. (NASDAQ:STEC) using call options. The results from the trade can be read here. A couple weeks ago, I chose to speculate with a stock LaserCard (NASDAQ:LCRD). The results from that trade can be read here. Some of these stocks will sell off, and some will continue to move higher, it is important to use caution when purchasing and use discipline when selling. All of these stocks have had moves higher on huge volume (% volume increase compare to 50 day average). Data as of market close August 7 2009. The stocks which I'll be watching for the week of August 10, 2009 are listed in the table below. The majority of these stocks are up big on earnings announcements, therefore it is ideal to wait for some kind of a pull back. The stocks which are most attractive to me are TreeHouse Foods (THS), and King Pharmaceuticals (KG). TreeHouse Foods Trade: I believe TreeHouse Foods is a buy judging by the quarter they just had, they still have a lot of shares short looming. The short interest as of July 31, 2009 was almost 19% and it popped on short covering, but there are still plenty of short shares out there. If it starts to pull back additional shorts should cover causing the stock to stay pretty stable, therefore the trade I am using is the Buy/Write option strategy. I'm looking to get into this stock for around $35 a share. If I can purchase it near that price and implied volatility [IV] is increasing I'll likely choose to write it our for a near term (September) $35 strike. Pocketing the premium should give me roughly a 6%-10% profit assuming it is assigned at options expiration. If IV is declining I'll likely wait to purchase the underlying stock until the options experience an increase in IV (as the option premiums will soar with greater IV). In both cases, as IV falls I'll look to purchase the option back and sell the underlying stock if profitable, if not I'll simply wait for another spike in IV and write the stock out again (this will continue until I am called out or decide to sell the underlying). King Pharmaceuticals Trade: They reported Thursday, and the stock continued to demonstrate strength during Friday's trade. The stock has very strong technicals and looks like it can keep going, but I wouldn't be too sure so I'm not jumping in with a lot of money. I've decided I'm going to all out speculate, and purchase the September 10 call options on the next pull back (if we get one soon). The current options market is factoring in a $15 decrease per contract for each quarter the stock moves lower, so I'll look to get in on a 50-75 cent per share pull back, which would equate to paying roughly $30-$40 per call option contract. If I happen to get into these contracts, I'll monitor the position and trade out of it on strength. The two trades outlined above involve the use of stock options. To learn more about the risks, pricing, calculations, strategies, and options in general click here. The reason option volumes have surged in the last 5 years is because they are a great way to hedge your portfolio as well as create income off of your shares. People keep calling me a bear, but I'm just being conservative. Given the rally we've had, I think it's a great time to take profits. I was selling a lot of covered calls for the August expiration Thursday, as we approached market close. I'm getting conservative because I think we're due for a pull back on the major indices. Reason 1: The recent activity in the Volatility Index (VIX) is telling me a short-term sell off may be near. Historically the VIX and the S&P 500 have a negative relationship (as one increases the other decreases and vice versa). However the 5 day chart above shows both have increased together in recent trading. This signals a sell off may be near in my opinion, or at least a lot of traders are betting on a sell off short term. Reason 2: Simple profit taking. The unemployment data coming out Friday, whether it's better or worse than expected, I believe profits will be taken. If it's better than expected data, I believe it will sell off because it is already factored into this recent market rally, and if it's worse than expected data... It should send a signal that the market may be overvalued considering the worst may not be behind us. Reason 3: Earnings season is coming to an end. With the majority of companies beating estimates (simply because revisions have been set extremely low), it has certainly contributed to this ongoing rally. I believe the "better than expected" earnings quarter has inflated these stocks too fast on a short term basis. As I stated earlier, I've been selling covered calls on many of my stocks to protect my position. I've also stated in my blog recently, that this market can continue to rally, as there's still a lot of cash on the sidelines. Selling covered calls is a great way to create income off the shares in your portfolio, as well as allow for an additional gain as well. Selling covered calls is ideal for this type of speculation, which is why I have decided to outline 25 ideas in this article. To learn more about this strategy, and stock options in general click here. I will use the 25 largest stocks (by market cap) in the S&P 500 for my analysis. To understand the table, I will give a detailed example of Goldman Sachs (GS) below. Sell the Goldman Sachs (NYSE:GS) in the money August 165 strike call option. The premium received from the call option would give a downside protection of 3.00%. If the stock is assigned at options expiration on August 22, 2009 the total return from this position would be 1.95%. A more bullish approach would be to write out the Goldman Sachs 170 Call option. This approach would protect to the downside 1.54%, and if the stock is assigned at expiration it would return 3.49% (in 15 calendar days). The August options expiration is 15 calendar days away, so it may be best to monitor the position and buy back the call option on weakness of the underlying stock, if the stock rallies after it is purchased back, write it back out for a higher premium etc... The weekend will take some premium away from these option contracts as well which is another positive to being the seller of these options. According to the current Theta, the 165 call option will lose roughly $25 per contract, and the 170 call option will lose roughly $23 per contract sitting inactive over the weekend. To better understand options in general, including this strategy, these percentage calculations, and other option strategies click here. As an owner of both Goldman Sachs and Bank of America shares, I've written some / will be writing more in the days to come, as the volatility of the underlying stock gives a very nice premium, even on out of the money options and 2 weeks until expiration. As the Volatility index is creeping back up, call option premiums should increase in value overall, protecting and giving an even higher return. I use this strategy to write my shares out on strength, and purchase them back on weakness (if I am profitable). For example: using this strategy has allowed me to cost average my position on Caterpillar (NYSE:CAT) down to $4.88 a share. Patience is the key to succeed with this strategy. If the stock gets called out, and you miss some of the upside, you can always use the buy/write option strategy to get the stock back for the following month. With the VIX at historic highs and call premiums exploding, selling deep in the money covered calls on my shares from September to December allowed me to trump the market, and actually make a profit. As stated in Is it Time to Put the Banks in Place? Using Put Options to Purchase Stocks I outlined some ideas I may be using to sell put options on the hottest stock sector, the financials. This is similar to that article, but this post is concentrating on the "hottest index", which happens to be the NASDAQ. To reiterate my previous blog post: The activity in the Volatility Index [VIX] is hinting at a short term sell off in my opinion, not to mention I don't want to be completely long before Friday's unemployment number, nor after this market runs out of "earnings steam". However, I am bullish long term (and who knows if the market will react good after earnings season is over and if it rallies on the unemployment data etc...). I would like to get into these companies for less (on weakness), which makes this type of strategy ideal for this type of speculation, and instead of waiting on the sidelines with a stock limit order, it will allow for me to participate in the market in case this rally keeps in going. In this article I will write about the top 20 stocks in the NASDAQ 100 (by market cap) using this strategy. If you'd like to learn more about this type of strategy or more about options in general check out my blog or options trading E-Books here. I'll also write about using this strategy on three popular Tech ETF's following my analysis of the twenty companies. All data as of market close Wednesday August 5, 2009. NOTE: When using this strategy, I first decide what I am willing to pay for the stock. Let's keep it simple and say I'm willing to buy the stock/ETF at a share price of 7% lower. Strike: The closest contract strike price to the 7% lower price. It may be slightly higher or slightly lower than the 7% lower price. Adj. Cost: This is the adjusted cost for the stock, if you do happen to end up with the shares at expiration. All of these options expire on September 19; therefore the last trading day is Friday, September 18, 2009. I have been using this strategy to purchase my shares and I find it has been working well. It's a bad idea to use this strategy as a form of speculation, in other words selling a put for the premium just because you think a stock will never get to a lower strike by options expiration. Remember even if the stock goes to $0 a share, you're still obligated to buy it for the indicated strike. It is important to note that if the stock is below the indicated strike at expiration, and you don't want to take the shares into your portfolio at that point, you can purchase the put contracts to close the position, and sell a similar strike (usually I sell the same one) for the following month (known as rolling). The reason option volumes have surged in the last 5 years is because they are a great way to hedge your portfolio as well as create income off of your shares (see CBOE option volume chart here). These are just examples, if you're more bullish/bearish, you’ll want to adjust the strike price and expiration accordingly. As stated in Why I Sell Put Options Instead of Setting Limit and Market Orders Part I and Part II, I will outline 13 more ideas on the major financial stocks/ETF's. As we know the financial sector has rallied the most since March 6, 2009 and although many of them still have bullish technicals, I am being very cautious getting long on them. However, I am bullish long term and would look at getting into any of the major financial companies for 10% lower. This strategy is ideal for this type of speculation, and instead of waiting on the sidelines with a stock limit order, it allows you to participate in the market in case this rally keeps in going. In this post I will demonstrate this option strategy on a list of 13 popular financial stocks/ETF's. To learn more about this option strategy and options in general check out my blog or options trading E-Books here. All data as of market close Tuesday August 4, 2009. NOTE: When using this strategy, I first decide what I am willing to pay for the stock. Let's keep it simple and say I'm willing to buy the stock/ETF at a share price of 10% lower. Strike: The closest contract strike price to the 10% lower price. It may be slightly higher or slightly lower than the 10% lower price. The stock market futures are currently in the red after another nice rally on Wall Street. The current DOW futures are down 39 points, S&P futures down 4.40 points, and NASDAQ 100 futures lower by 6.50 points. I know I'm a day late as I usually post this on my blog Sunday night, but it's better late than never- right? In this post I have identified an updated list of 26 stocks which have broken out on big (very unusual) volume. As always, I believe the stocks listed in this post are worthy of adding to the stock watch list. As stated at the bottom of this post, I have chosen two stocks from the list which I may be speculating with in the weeks to come. Last week I had a stock LaserCard (NASDAQ:LCRD) which I speculated with Monday the day after posting it, and the day they reported earnings (after the bell). It is a week later, and up over 50%. Here is the outcome to that trade. As stated in previous blog posts, I'm a firm believer of stocks which have had significant moves higher on big volume. Some of these stocks will sell off, and some will continue to move higher, it is important to use caution when purchasing and use discipline when selling. All of these stocks have had nice moves higher on huge volume (% volume increase compare to 50 day average). As of August 3 2009, the stocks which are on my watch list are listed in the table below. As you may know, some of these stocks could give back all of their gains just as quickly, so instead of purchasing the stock, sometimes I purchase at or near the money call options on the stock. Purchasing call options is a cheaper way of opening a position on a stock, but if the stock sells off, you'll lose 100% of the premium you paid for the option and will not hold the stock, however if the stock continues to rally, you're % gain will most likely be much greater than if you purchased shares on the stock. To learn more about options in general check out my blog or stock option trading E-Books here. Not all of these stocks have options traded on them, but the ones which do could pay off in big ways. I used this strategy when purchasing STEC Inc (STEC), and LaserCard (LCRD) and it paid off as both continued to rally after the calls were purchase (see more here). Advanced Battery Techs (ABAT), and Valassis Communications, Inc. (VCI). ABAT Option Trade: Purchase the September 5 call options, as they are going for roughly $30 per contract. The price of this call contract was up 250% today on an 8.64% move up in the stock. I would look at getting in for $15 to $20 per contract on slight weakness in the underlying stock. Obviously if the stock sells off greatly I would scrap this idea, but if it pulls back slightly to the $4.15-$4.30 range I think contracts could be purchased for this price. They are scheduled to report earnings on August 12, so if I get in and have a profit I will likely choose to lighten up before earnings. ABAT hit a new 52 week high today, on increased volume of about 50% so a continuous run isn't out of the question. VCI Option Trade: The strategy I am looking at for this stock is to purchase it and write an in the money call for the August 12.50. It is currently in the money by 40 cents. If the stock can hold above $12.50 a share (the stock is assigned at expiration) by August 21, 2009, the return on this position would be 5.8%. The downside protection on this stock is 8.9%, so if the stock does not expire 8.9% lower than the current share price, this position will also be profitable. These guys are coming off a great earnings report. They have rallied over 55% since their earnings release, so I will certainly be looking to get in on weakness. As previously stated on my blog, this rally could continue through August; but what if it doesn't? What is the market sells off? Well nobody knows for sure what will happen in the month to come, but getting conservative and taking profits never hurt anyone. July was an unexpected bull run, and I have to say the economy still isn't that great... I would hate to be completely long before Friday's unemployment numbers come out. So in this post I will explain why it may be a good time to get conservative, and how a simple option strategy allows you to do this. This strategy actually allows you to both protect and profit. The strategy is the buy/write option strategy, and requires the stock to be purchased and a covered call option to be sold immediately against it. The premium received will lower your cost basis (providing downside protection), and the strike price the option is written for is out of the money so it allows additional upside gains on the stock. To learn more about options check out my blog or options E-Books here. 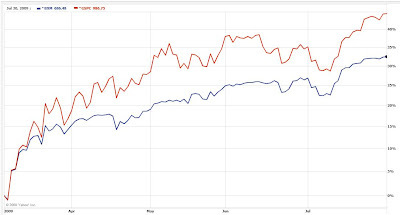 The chart below from Yahoo finance has the CBOE Buy/Write Monthly index versus the S&P 500. The BXM is a passive total return index based on (1) buying an S&P 500 stock index portfolio, and (2) "writing" (or selling) the near-term S&P 500 Index (SPXSM) "covered" call option, generally on the third Friday of each month. The SPX call written will have about one month remaining to expiration, with an exercise price just above the prevailing index level (i.e., slightly out of the money). The SPX call is held until expiration and cash settled, at which time a new one-month, near-the-money call is written. As you can see up until 2008, both correlated very well. However during market sell offs the buy write strategy protects the portfolio. The bad part about the buy/write is that during bull markets it does not return as much (see chart below since market bottom March 6, 2009). Since the market bottom, the buy/write strategy would have returned less than being completely long. However what are the chances this market rallies another 45%? Judging by the Volatility Index (VIX), I believe this market is due for a short term correction phase. I am bullish long term, but anticipate a 5%-7% sell off in the coming months. This strategy is ideal for this type of speculation. So, I have outlined a list of the top 50 companies (by market cap) in the S&P 500 using this strategy, and will analyze which company is what I call the "best bang for the buck" or which one yields the best combination of both downside protection and potential return. All data as of stock market close Friday July 31, 2009. For this analysis I am taking a more conservative approach and writing the option nearest to 3% lower on the share price. The strike price can easily be adjusted for a more bullish approach (less protection and greater return). Purchase Apple (NASDAQ:AAPL) stock, and sell the in the money August 160 strike call option. The premium received from the call option would give a downside protection of 3.86%. If the stock is assigned at options expiration on August 22, 2009 the total return from this position would be 1.78%. The current options market is factoring in a 64.5% probability that the share price of Apple will be at or above $160 by August expiration. A more bullish approach would be to write out the Apple 165 Call option. This approach would protect to the downside 2.14%, and if the stock is assigned at expiration it would return 3.13% (in 19 calendar days). However the probability on this call option is lower, factoring in a 45.8% chance Apple will be at or above $165 a share at August expiration. As you may have noticed, the less volatile the underlying stock and greater the probability of expiring at or above the indicated strike price, the less the return percentage is. Based on this analysis of 50 stocks, the stocks which offer the "best bang for the buck" are Cisco Systems (NASDAQ:CSCO), Bank of America (NYSE:BAC), and Comcast (NASDAQ:CMCSA), as they are all above the average in all three categories (return %, protection %, and probability %). I personally like the Bank of America idea, and will be looking at opening up some buy/writes for the August expiration in the days to come. To better understand options in general, including this strategy, these percentage calculations, and other option strategies click here. As the Volatility index is creeping back up, call option premiums should increase in value overall, protecting and giving an even higher return. I use this strategy to write my shares out on strength, and purchase them back on weakness (if I am profitable). For example: using this strategy has allowed me to cost average my position on Caterpillar (NYSE:CAT) down to $4.88 a share. Patience is key to succeed with this strategy. If the stock gets called out, and you miss the upside, the position is still profitable and you can always do it again for the next options expiration. If the stock gets hammered and you're down on the position, this strategy will keep you in the game and allow you to cost average the shares down month after month. So in case the summer rally fades and turns into a summer sell off, these are just some strategies which can be used to help pad the portfolio, without spending additional money by purchasing put protection.